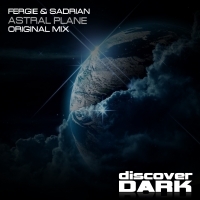 Fergie and Sadrian return to the dark side of Discover with their latest offering - Astral Plane. It's a full on psy excursion featuring a host of other influences which ensure the tune brims full of originality from the start. Rolling bass, stabs and hints of melody fire in throughout the build which opens into the breakdown in all its full on trance beauty held together by the coolest of vocals. A sonic journey throughout, Astral Plane does not stand still for a second offering a full dance floor peak time work out. 'Astral Plane' is available now from Beatport and iTunes.